There are many tools in the market for BPMN™ modeling and execution and some of them are supporting the new BPMNDI standard by OMG for data exchange format. 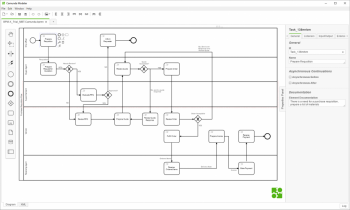 A good implementation of BPMN™ modeling and data exchange is CAMUNDA, an open source tool for process automation. BPM-X® is a model bus software for diagram and model interchange with the capability to generate test cases for different tools. The created *.BPMN model file is loaded into the BPM-X® model bus using the BPMNDI adapter. After having loaded the model into the model bus, operations like automated test case generation as well as writing them to the target system can be executed. Processing a BPMN™ model [is a kind of simulation of the model] involves the analysis of all possible end-to-end paths of the model and the corresponding generation of test cases. The algorithms are based on model-based testing (MBT). During the processing a cost optimization is performed to calculate the minimum number of required test cases. This optimization can lower the number of generated end-to-end paths to cover all tasks, all transitions, all paths and even higher coverages based on needs for quality. After the optimization each end-to-end path becomes a test case with specifically assigned custom data attributes. 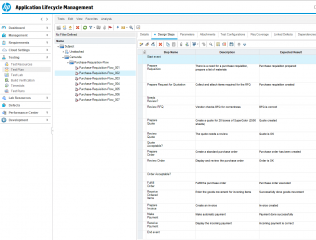 The BPM-X® model bus then uses its HP ALM adapter to transfer the test cases via the REST web service interface into the specified HP ALM test plan module folder.